I heat embossed white with an older Hero Arts background stamp. I do not use this stamp often! I first used a mix of Lights AI, blue pink green, but I really disliked it so I went over it with a darker blue and silver mixitive. That looks much better. I photographed it before the Nuvo drops on the bird stamp dried. Trying to get it finished and still have time to go to the store! I had no idea what sentiment I wanted to use, so i left it off for now and can add on in the corner later on. So lovely, Heidi! The technique did very well on the regular cs. I love the bird image. 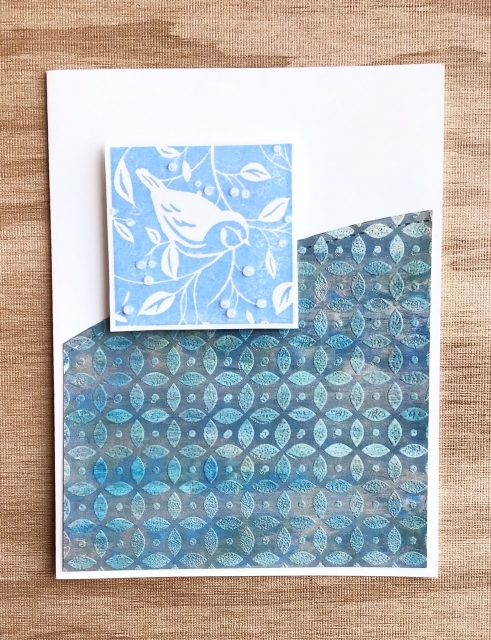 Terrific work changing up your background and making it into a lovely card! Your background turned out great. I think I have that stamp! I really like your little bird image too.